"One day, this will all feel like a dream." That's an inspiring, but also, emotional quote from Michael Fassbender in The Light Between Oceans, an emotionally devestating masterpiece. Fassbender portrays Tom Sherbourne, who has just finished serving in the Australian military on the Western front of WWI. 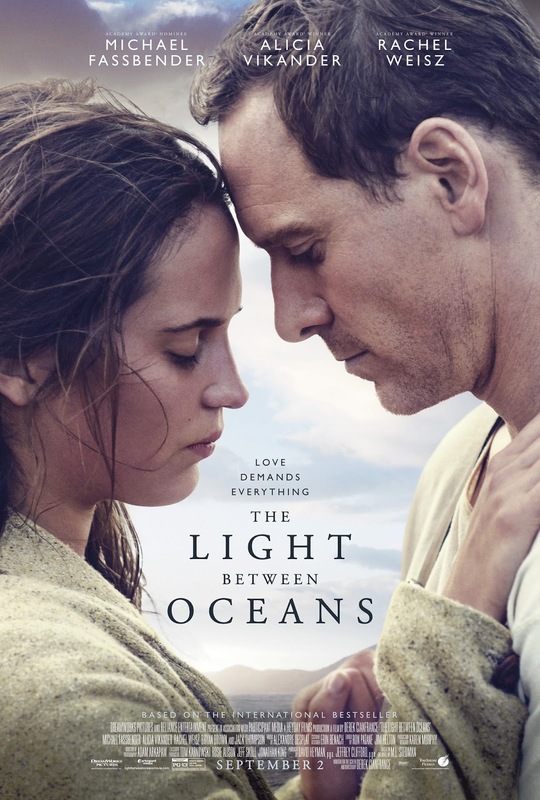 Tom, asking for some time alone to himself, accepts a temporary job as a lighthouse keeper on the secluded island of Janus Rock, a hundred miles off the coast of Western Australia, between the Pacific & Indian Oceans. Eventually, he is called back to the mainland town of Point Partageuse, where he is told that his job is now permanent. On the mainland, he meets Isabel Graysmark (played by Alicia Vikander), the daughter of the town's reverend. Eventually, after months of writing letters, they get married, & both return to Janus Rock. However, after two miscarriages during their marriage, Isabel becomes severely depressed, sitting by the graves they set up for their stillborn children. One day, an astonishing event occurs. A small boat washes up on the beach, with a dead man & an infant girl in it. They look after the baby for a few days, before Isabel wants her & Tom to raise it. Tom wants to report the incident, so they could eventually adopt it, but Isabel, fearing that they wouldn't let them adopt her because they live in seclusion, does not want that to happen. She believes that since no one knew she miscarried again, they could say that she gave birth early & no one would be the wiser. Eventually, Tom agrees, buries the man's body, & they raise the girl, naming her Lucy, & all is well on Janus Rock. Four years later, they return to the mainland for the first time with Lucy. While there, they meet Hannah Roennfeldt (played by Rachel Weisz), a local woman who encountered a horrible tragedy. Four years prior, her husband & daughter died at sea. They both recognize immediately that Lucy is Hannah's daughter, Grace. Tom wants to tell the truth, but Isabel is adamant that they do not tell her that they have her daughter. This leads to a harrowing series of events that changes everyone's lives forever. Fassbender, Vikander & Weisz give heartbreakingly excellent performances, making you feel sympathetic for them all. The direction & screenplay from Derek Cianfrance is amazing, with Cianfrance directing another excellent film after 2010's equally emotionally devestating Blue Valentine, & 2013's underrated The Place Beyond the Pines. The film score from Alexander Desplat is beautiful. And the cinematography from Adam Arkapaw is breathtaking, with absolutely stunning shots of the ocean. This is definitely one of the best & underrated films of the year so far.